Note: Thanks to St Martin’s Press for providing an Advance Reading Copy of this title. Twelve years ago, a blizzard descended on the town of Coventry, New England. Nothing special there, but this storm was different. By the time the snows had cleared, the town was torn apart. People had simply disappeared, vanished into the drifts leaving not a trace behind. Worse, others simply did not survive the night at all, falling prey to the weather as well as forces unexplained. In its wake the disaster deposited desperation and emptiness, changing the lives of those left behind forever. Now the storm is returning and people are acting more than a little strange. 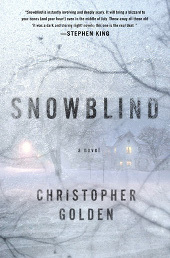 I’ll get this out of the way right off the bat – Snowblind is receiving a snowplow-load of comparisons to early Stephen King and I can’t help but agree. It has all of the ingredients: north-eastern US setting; down-to-earth characters; supernatural forces. Hell, the man himself even gave it a spot of cover blurb. Does it live up to the hype? And does Golden have a distinct enough voice to wrestle free of his obvious inspiration? Well, the answers are both resoundingly positive. Snowblind features without a doubt one of the most gripping and fraught opening acts I’ve read in years. Comprising of a flashback to the original devastating storm it proceeds to set up a believable and intriguing cast of characters before suddenly turning on them and putting them through hell. By the time I had caught up to the present day I had forgotten that this was just a taster, that the meat of the story was yet to come. There were no guts, no gore, not my usual horror fare at all. Nothing but a creeping sense of unease which reached an eventual crescendo, leaving me glancing at the windows to make sure no unwelcome faces lurked there. And then… silence. Like the calm following the storm Golden then surveys the damage he has wreaked, taking in the shattered lives, the broken families, the loss of hope. Without lingering too long on the scene you’re left in no doubt about the scale of the emotional damage caused to adult and child alike. But there’s only a short time to catch your breath before Snowblind pulls you back into the eye of the storm for an intense final act. Christopher Golden does indeed have some stylistic similarities with the master of horror but where King’s older works can occasionally seem dated and a little twee these days, Golden is sharp and thoroughly contemporary. I’ll admit it hurt to see him use the word ‘hipster’ so often, as if it were some kind of virtue, but I’ll let that slide. His words pull you along effortlessly into the story, so much so that it feels more like the book is simply happening to you, rather than you actively reading it. Even though the eventual explanation of the storm’s terrible power seems a bit stretched in hindsight it doesn’t detract from the power of the story at all.